Before I eat every last nut and forget all about them, I have one more snack recipe–a holdover from yesterday. 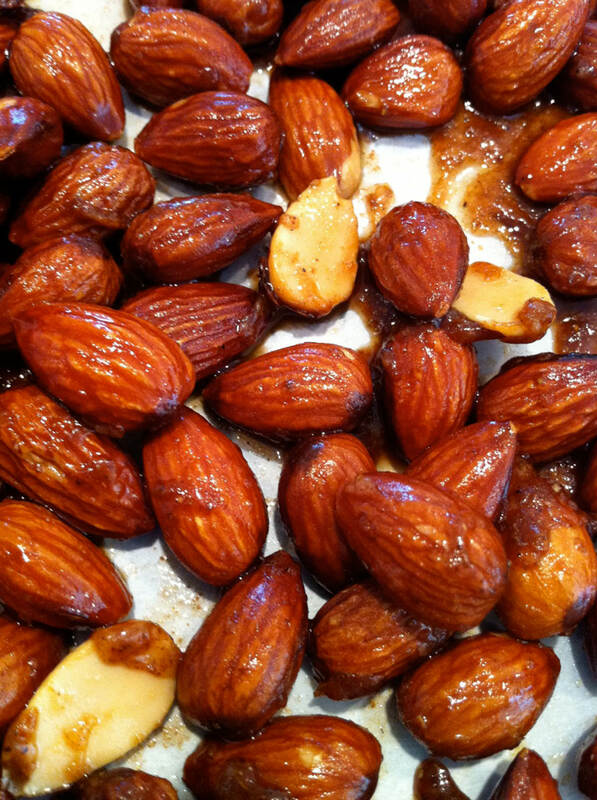 My son helped me make these, which is probably why they taste so good: ) Truly a tasty bite, these almonds have a spicy flavor with a salty/sweet kick! In a large bowl, combine cumin, ginger, salt, oil, hot sauce, and honey. Add almonds and toss to coat. Spread in a single layer on a baking sheet with sides and lined with parchment paper. Bake at 300 degrees for 30-40 minutes, stirring every 10 minutes, or until lightly glazed. Cool in pan or on a wire rack. Store in an air-tight container. For a little extra punch of that salty/sweet flavor, sprinkle with a pinch or two of course sugar and kosher or sea salt upon removing from oven.